Taking the whole family on a beach vacation this summer? Want an apartment in the big city for a long weekend? Why, you’ll need to book an Airbnb rental for that, right? Sure, if you want to run the risk of being secretly filmed by your host, as one couple recently discovered was happening to them at a Longboat Key, Fla., rental. Or if you’re OK with the possibility that your host might cancel your booking at the last minute for no reason or because of your race, as occurred in February with a Big Bear, Calif., rental. Or if you don’t mind that the place you’re renting might not have the proper insurance, safety measures or even be legally available for short-term rentals. Or, you could utilize the vast resources of the Virtuoso network and stay at a place that has been properly vetted, offers services such as housekeeping and lets you enjoy your experience instead of worrying about what’s actually waiting for you when you arrive and potentially dealing with issues that turn your vacation into a big hassle. Virtuoso-preferred partners offer a vast array of accommodations around the world. In addition to many Virtuoso-preferred hotels having private villas and apartments, there are several companies who specialize in just this sort of thing. Villas of Distinction features properties all throughout the Caribbean, in several European countries, Hawaii, Colorado, Florida and so much more. You can filter the number of bedrooms you need, the type of experience and level of service you’re looking for, and special features such as beachfront or fully staffed until you’ve found the villa that is perfect for you and your crew. Abercrombie & Kent doesn’t just do great tours, from magnificently crafted group and family journeys to completely customized private itineraries, the company also has alpine chalets and luxury villas from Andalucia to Umbria at the best addresses in Europe. So after you return from a day of breathtaking touring with your driver and guide, you can sit down to a gourmet meal prepared by a private chef. Sure beats rummaging through the fridge at an Airbnb. Say you’re off to Los Angeles, San Francisco, Miami, New York, Paris, London or Rome for a long weekend, a week or a longer stay. Instead of booking a hotel, you’d rather live like a local and have a larger living space with all the comforts of home. Onefinestay has a whole roster of apartments, condos and lofts in those cities, plus an ever-expanding list of global destinations. Onefinestay visits each home before renting it and has a guest services team ready 24/7 to assist guests. Good luck getting a hold of your Airbnb host at 3 a.m. Ski season is upon us, and you might need help finding a place that checks off all the items on your wish list. Ski-in/ski-out, hot tub, whatever the request, Alpine Adventures has the rental for you, from Vail to Verbier, Crested Butte to Courchevel and just about anywhere else skis and snowboards tear lines. There are so many more choices, from the villa collections of Virtuoso-preferred wholesalers Travel Impressions and Classic Vacations to the beautiful villas along Lake Como available through the all-everything Italy specialists at IC Bellagio. Now aren’t you glad you don’t have to worry about an Airbnb host dropping by without notice during your romantic dinner? You can do this and more by booking a Tauck Event where once-in-a-lifetime experiences make Tauck Events, including the Celebration of Roses, Roman Holiday and The Civil War Event, one-of-a-kind anywhere in the world. Unique travel experiences based in one destination and built around cultural, historical or sports-oriented themes, Tauck Events showcase what Tauck does best – offering authentic, theme-driven experiences that inspire learning and create an emotional connection with the topic and destination. Small group sightseeing tracks – featuring Tauck’s uncommon access to places and experiences you can’t have on your own, behind-the-scenes insights from noted experts, and personalized service by Tauck Directors – are highlighted with extraordinary gala evening events in places not privately accessible to the public – and virtually impossible to replicate. Limited space is still available, but is filling fast. Book today! 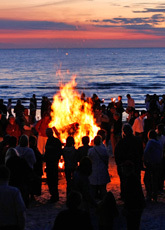 CALL US TODAY FOR MORE INFORMATION ON THESE UNFORGETTABLE EVENTS OR ANY OTHER OF TAUCK’S AMAZING ADVENTURES. Just back from Travel Weekly conference in lovely Seattle. After some great seminars and meetings with very interesting suppliers, I took time to visit the beautiful Fairmont Olympic Hotel (a Virtuoso preferred property which gives our clients special rates, VIP amenities, free breakfast, complimentary upgrades and more) . I then took the great little monorail to the Space Needle for fabulous views of Mt. Rainer, the Cascade Mountains, Olympic Peninsula and San Juan Islands – this city certainly is in a stunning location! At the foot of the Space Needle, the incredible Chihuly Garden and Glass Exhibit is a definite must see for all visitors to this beautiful city. If you are looking for some activity on your next vacation, one of these biking or hiking programs will have you enjoying every minute and feeling fit! Call us for full itinerary details and more information…..
NEW! Big Sur Coast: Monterey to Santa BarbaraSuspended above the Pacific and hugging the edge of the continent, this is one of the most spectacular routes in the state. And a ride that every cyclist should experience. From dramatic coast and majestic redwoods to historic missions and charming Carmel-by-the-Sea, a breathtaking adventure awaits. Not to be missed: Bike famous 17 Mile Drive along “the greatest meeting of land and water in the world,” then test your legs on the cliff-clinging Cabrillo Highway past wind-torn cypresses. Death Valley: California’s Mojave DesertThere’s no better way than biking and hiking with Backroads to experience the rich palette, surreal geography and many moods of this fascinating national park. 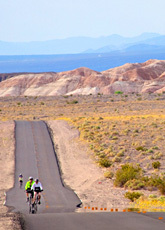 Pedal across shimmering salt flats. Amble among rainbow-colored rock formations. Discover volcanic craters and giant sand dunes. Then capture the panorama—and maybe even a stunning desert sunset—from a red tail hawk’s perspective at dramatic Zabriskie Point. Not to be missed: How low can you go? Descend to Badwater, the lowest point in the Western Hemisphere at 282 feet below sea level. 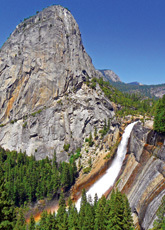 Yosemite: Natural Wonders of the Sierra NevadaWelcome to 761,266 acres of “Wow!” Half Dome, El Capitan, Yosemite Falls, the Mariposa Grove of Big Trees—the grandeur of Yosemite is almost overwhelming. Exploring actively with Backroads, you’ll appreciate the park from all perspectives. Soak up jaw-dropping vistas from Glacier Point, while savoring mountain air perfumed with ponderosa and cedar. Stroll among the largest sequoias in the park. And get cozy at the iconic Ahwahnee Hotel, a National Historic Landmark. Not to be missed: Marvel at Grizzly Giant—no, it’s not a bear, but an awe-inspiring sequoia, some 2,000 years old with a base diameter of 30 feet! 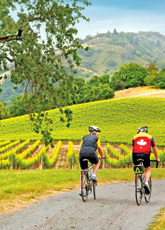 Wine Country: Through Napa & Sonoma Vineyards, Redwoods & CoastSavor every drop of your visit to Wine Country as you cycle, sip and Shiatsu your way through the renowned valleys of Sonoma, Russian River, Alexander, Dry Creek and Napa. Just as there’s a vintage to suit every palate here, there’s a diversion for every interest: country roads perfect for biking, welcoming wineries, sensational cuisine, chic galleries and luxury spas. Not to be missed: Find heaven at the Sonoma Mission Inn & Spa, where you’re treated to the Roman Bathing Ritual—an exfoliating shower, warm bath, hot bath, herbal steam, sauna and rehydrating drinks. 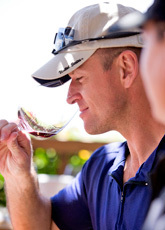 Wine Country Weekend: Through Alexander & Dry Creek ValleysJoin us for the ultimate three-day wine country getaway. You’ll side-step the crowds and savor much of what makes this pocket of Northern California one of our favorite places: gorgeous vineyard vistas, quiet country roads, gourmet meals and elegant hotels. And connoisseurs and casual sippers alike will delight in uncovering some of the region’s premier wineries. Not to be missed: If you love fine cuisine, you won’t want to miss our dinner at the Madrona Manor, whose chef has been awarded a coveted Michelin star! NEW! 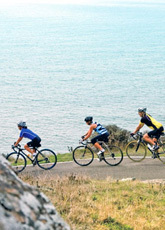 100+ Singles in California’s Wine CountryBe sure not to miss out on our exclusive one-time-only Bike, Camp & Fiesta trip coming up in California’s Wine Country from September 30 to October 5. Imagine having the time of your life biking, wine tasting, hiking, dancing, dining and laughing with 100+ like-minded singles. Best of all—thanks to the camaraderie that flows naturally on every Backroads adventure—you’re sure to leave the trip with new friends. So come join us and experience it for yourself! The whistle blows. The paddlewheel churns. The calliope plays. As the champagne flows, get ready for the celebration of a lifetime onboard the grand American Queen. You are invited to join us and be one of the select few to experience our very special christening voyage. Together, we will be among the first lucky travelers to make history, on theAmerican Queen’s Inaugural Voyages which will be filled with many special surprises. You will be treated as honored guests as you step aboard the most opulent and legendary riverboat ever built, the fabled Steamer American Queen. With luxurious staterooms, extraordinary dining overseen by famed American chef Regina Charboneau, superb showboat style entertainment, and an All-American crew, we think that you will agree that theAmerican Queen offers a river cruise experience like no other. St Paul, Louisville, Chattanooga and Vicksburg, the grand American Queen is never more than a leisurely few-hours drive or train ride away. We even offer convenient and affordable connecting luxury-motorcoach service between port cities and special rates on Hertz #1 Gold one-way rentals and Amtrak fares. Call us now to plan A Fabulous vacation on the American Queen – so close to home.